They say you can’t judge a book by its cover, yet I chose this book solely because of just that. I saw the cover art on First Second’s (@01FirstSecond) Twitter page and then immediately picked it up at my local library. 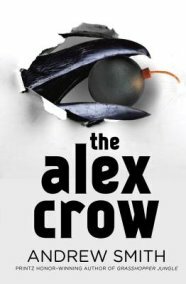 I didn’t know what to expect from The Alex Crow even after reading its synopsis. It’s comprised of three seemingly unrelated stories that, as you probably guessed, ultimately merge. The first story focuses upon Ariel, a Middle Eastern refugee trying to make sense of his tortured past and his perplexing present after a family in West Virginia adopted him. They also have a son Ariel’s age and a reincarnated crow named Alex. Alex is not reincarnated in the strictest sense. Ariel’s new father works to reintroduce formerly extinct species through his scientific endeavors. Ariel and his new brother, Max, are soon sent to camp where they are meant to bond. Unfortunately, the camp is intended for boys addicted to gaming, and when surrounded by teenagers going through cold turkey, both Ariel and Max feel as though they’ve been dropped into an asylum. The second string focuses upon a mad bomber named Leonard Fountain. Leonard believes he’s trailed by an invisible drone, hears voices, and has skin that is literally falling off his body. He drives his U-Haul around the countryside, listening to the voices help him find the perfect place to detonate. As fate would have it, he’s connected to the Alex Division of the Merrie-Seymour Research Group, the very company where Ariel’s adopted father works. The last plotline features a doctor in the late 1800s aboard the Alex Crow, which is a sea faring vessel attempting to reach the absolute north. When the ship becomes trapped in ice for months on end, the doctor and his shipmates must fight for their very survival. They eventually find something encased in the ice, something long since dead, something hellish, and the doctor knows then and there that he must somehow reincarnate it, even if it takes a century. The Alex Crow’s genre is undefinable, which is the highest compliment I can offer any work. Though it features young adults, this old man very much enjoyed it. At times the book is brutally realistic, especially when revealing Ariel’s past, but it also holds nothing back in the realm of science fiction. It is at times adventuresome, creepy, absurd, touching, unsettling, and thought provoking. Amidst its multifaceted threads, however, it is consistently humorous. The humor is sometimes good-natured, sometimes discomforting, and sometimes inappropriate, but it is always there. Though I’ve discussed the major beats of The Alex Crow, this book is complex beyond description. One must read this book truly to experience Smith’s originality, intricacy, and hilarity. I highly recommend you do so. This entry was posted in Book Reviews and tagged andrew smith, arts, Book Review, books, entertainment, literature, read, the alex crow.